A student organization here on campus has tried to give us a visual of death-by-warfare in Iraq. More than three thousand American, more than six hundred fifty thousand Iraqis. They chose pin flags, of the kind I used to see all over the place when I worked in the woods, usually as what we called "plot centers." The red flags are the Americans, the white flags are the Iraqis, mostly "collateral damage." But there wasn't enough money to place one flag per person. So they are still looking for funds to buy more white flags, but at present one white flag represents six Iraqis, which could be taken to mean one American is worth six Iraqis, but that isn't the intent. The result is stunning anyway. 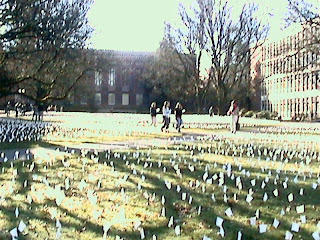 The "cemetery" covers all of the quad in front of the Library, and right around the corner to the Student Union, or about three acres. It would take about fifteen acres to display one flag per person. When I rolled out, in my wheelchair, to have a look, I just wept like a baby, as have many others. The display will remain up for two weeks, and then may travel to other sites. It's well worth a visit. Beloved is still rubbing the area on the back of her head that she says "feels like a crew cut" -- though I can't see it through that luxuriant dark brown --now shot with silver -- pony tail she's always had. But now it was my turn to have surgery again. Mine was a chelectomy -- removal of a bone spur -- intended to make both my feet continue to fit the same shoe size and prevent the continuation of a limp that was threatening to cut short my hiking career. There's not too much to tell of this visit to Big Hospital, which was rather nice as that place goes -- but, hey! My wrist ribbon identified me as female for the first time there. So that was something, anyway. Once home, I practiced mucking about the house in a wheelchair which we had borrowed from the Meeting House -- then became violently ill, as usual, from after-effects of the anaesthesia -- then, next day, played with the wheelchair some more. There was a lot I didn't know. Chairs are marvels of ergonomic design, like bicycles, but that only takes you so far. There are presupposed, if you are going to be self-sufficient, a lot of conditions: food is within reach, drink is within reach, toilets are within reach, furniture not blocking your way, doors closable behind you, doorways wide enough, hallways with turning radius, light switches within reach, essentials not stored on shelves out of reach or in cabinets with doors that cannot be opened with the chair close by. I took to carrying a pair of tongs in order to reach things I was accustomed to getting at while standing. Then there was the matter of keeping the fire going. I could do this with the tongs -- but only with the lighter chunks of fir -- and when I ran out, there would be no more till Beloved got home from work. There are no ramps between me and the woodshed. I also found it difficult to deal with minor housekeeping. Balancing laundry on my knees, I could carry about as much laundry across the house in three long trips as I might otherwise in one short one. The refrigerator become much more difficult and interesting to work with, as did such a simple act as carrying a glass of juice to the dining room table. Just to get a mug of tea a while ago, I needed to roll to the dining room, pick up the tongs from the wood box, hang them on my brake handle, roll around through the living room to the kitchen, ducking under the corner of the chopping table, sidle up to the sink countertop, stretch with the tongs for the cup I wanted, put the cup in my lap, back up, turn around, roll forward, reach with it to the shelf above the stove (I know, bad place) where the teas live, choose a box and fish out a teabag, drop it in the cup, back up, wheel around, roll forward, sidle up to the sink, fill the cup, set it on the counter towards the pantry room, roll back, straighten out, roll forward, grab the cup and move it to the counter in the pantry room, lean back in the chair, push over the hump into the pantry room, which has a higher floor, roll forward, open the door of the zapper, roll back, put the cup in, roll forward, set for 77 seconds, wait, open the door, put the cup on the counter behind my shoulder, close the zapper door, roll back, pick up the cup, and drink the tea. I drank the tea right there by the zapper because I couldn't navigate back to the dining room without both hands on the wheels or carrying hot tea balanced in my lap. Another interesting discovery is that the chair will do some things that you want it to only if you develop a kind of body english remarkably akin to the movements of people we think of as having chair-associated diseases or conditions. In other words, the chair itself may be creating exaggerated psychological distance between an "us" (the "abled") and a "them" (the wheelchair-bound, those most easily identified as the "disabled"). My own home was like a world designed as if there were no people in wheelchairs. I'm expecting to be back on my feet within two weeks. Still! What an eye-opener. I'm ashamed of myself for not having known more about this. The chair got me to thinking about the situation with LGBT persons and families. The parallels are rich and obvious. The uncomprehending and hostile world, for us, is like a courthouse without a ramp, with no accessible restrooms or drinking fountains, no doorknobs, no self-opening doors, and no "disabled parking" outside. You can talk about "special rights" till you are blue, but for the chair-bound, if they can't get to the courtroom, they haven't got equal rights. When you hold partnership rights, housing rights, fair employment rights, and public accommodation rights out of the reach of people born different, the only one with "special rights" is you. If you substitute Transsexual for 'People with disabilities' in the foregoing, there is a pretty close match for most of the socially-driven disadvantages, as well as for the costs to society (scaled down for numbers) of the discrimination. Yet the Act goes on to say, under "Certain Conditions:"
The saving grace could be, though, "gender identity disorders not resulting from physical impairments." Here they are clearly trying to avoid messing with intersexuals. Thank you, but the line you've drawn, Auntie Sam, may not be in real sand. This is why science (not bogus science, just science: a study discussed here has since been replicated) needs to be done in the area of gender identity disorder. Remember: all social psychology is biology. Hopefully, more about this later. So that accommodations that make economic sense and promote justice for all can be part of the law of the land. Jasper Mountain with snow plow. This morning we awoke to the proverbial winter wonderland. I was wondering whether to attempt to go to work, so I walked (in almost five inches of white stuff) out to the end of the driveway and found no traffic at all except for a snowplow, something I had never seen on our road before. Beloved checked all the news programs, and concluded that everything, even the Federal courthouse, was down for the day, except of course the University, which traditionally ignores anything short of a half inch of glare ice. And tonight it's supposed to go down to 10 degrees (f.) with a lot of moisture still on the roads. In days gone by, I would have chanced going in, which I could have done by about 11 a.m., and getting stuck in town, maybe. Daughter has a roommate and a boarder, though, and Last Son hasn't been feeling well and has nowhere for me to sleep but his armchair. I'd have to go to a motel.I'm less comfortable having such adventures than I was, possibly partly because I'm grandmother age, but partly because I'm a girl now. Being stuck in a ditch is a little different for us than it is for guys. So I called in and took a Personal Leave day. I have three of those to burn as it is, and they have to be used up by July. I felt confused when I made the call, as though I were letting down the team, But immediately after I hung up, Beloved announced that lines were down on Jasper Road, and there were wrecks blocking the main highway, so there was no way I could get there in any case. Then the lights went out. But they came right back on a few minutes later, so that hardly counts as an outage, But there were clearly things going on around us.Maybe it would be okay to hunker down a bit. I went back outside and gathered a few beets from underneath the snow, and a few chard leaves and cabbage. I discovered green shoots of the border of elephant garlic protruding from the snow in a circle all round the garden. Some of the shoots are eight inches tall already! I took over the kitchen and made a steamed veggie dish for brunch. Also baked whole wheat/oatmeal bread, with chopped fresh garlic in the dough, in our new oven, which turned out well. And steamed a sweet potato and shucked and whipped it, to have with a trout dinner later in the day. The sweet potatoes or yams (we have both on hand) are a revelation. Simply slice lengthwise and leave in the tray of the rice steamer for twenty minutes on the timer. Set aside and let cool. slip the skins off the halves, drop in a bowl, add a small pat of butter or margarine and stir a fork around vigorously in the bowl until the halves have combined with a pudding-like consistency. Serve hot or cold as you wish.